If you’re wondering what happened in Like a River Glorious and would like a summary, the lovely Lana has provided a recap for you! The group finds a piece of land (Glory California) to claim as their own and start to build their homes. Lee tells the group that she can sense gold – the Hoffman’s leave but the rest agree to stay. Threats come from all sides and soon they lose almost all of their belongings in a fire, which was set on purpose by Lee’s Uncle Hiram. Tom, Jeff and Lee agree to meet him in Sacramento but are ambushed along the way. They are captured and drugged. Lee wakes up in a cabin where she faces her uncle Hiram again, who wants to use her to know where to dig for gold in his mines. Lee purposefully misleads him as she is outraged at the slavery she witnesses. Together with a few others Lee agrees to become a spy for the rebellion to free the slaves from the mines. Lee’s magic is becoming stronger. She and her uncle have a fight in which he claims to be her real father. Lee continues to smuggle gunpowder and laudanum for the rebellion. During a meeting at the church with the Reverend chaos erupts and many people are killed. Lee and her friends manage to get away, but she goes back because Hiram will always find her. They blow up half of his mine, when Hiram attacks them. Jeff and Wilhelm overpower him and Lee summons so much gold that she destroys the entire mountain mine. They go back home where Lee receives an invitation from the new Californian governor to attend the Christmas ball. They go and make a deal with Hiram’s collector named James Hardwick to grant Glory California a proper town charter once California becomes a state. Lee asks Jefferson to marry her and he says yes. 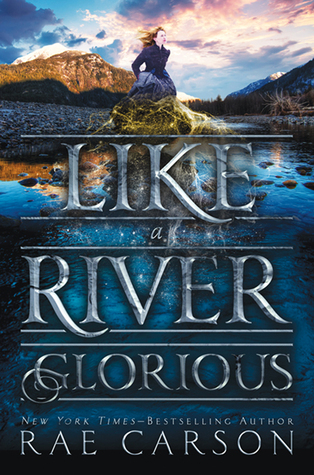 what happened in Like A River Glorious? When Lee senses a gold nugget nearby, she and Jefferson go off to explore. However before she can get to it, the group encounters gunfire and Jeff is shot in the stomach. Luckily the bullet only grazes his skin and Jasper fixes him up quickly. They head east. When Lee’s gold sense flares up near a creek, she stops the group and they stake their claim to make it their winter home: Glory California. Lee struggles with her secret and finally tells the truth – not everyone takes it well. The Hoffman’s decide to leave the group and Lee gives them all the gold she found so far. Lee teaches Jasper, Andy and Olive how to look for gold in the water. When they get back a stranger is waiting for them: ‘Old Tuck’. He promises to come back with paying customers who would happily pay for Becky’s (Mrs. Joyner’s) breakfast. They decide to remain friendly toward the strangers in order to keep Lee’s secret. The next morning Martin Hoffman comes back to their camp, not wanting to go home with his family. They welcome him back. Old Tuck asks Lee to marry him – she refuses (And this before Olive tells her that he first proposed to Becky, who said no as well). Jasper and the College Men come back with presents: a stove for Becky, chickens, a fancy dress for Lee…Jeff is mad because this will draw the attention of the wrong people. Jeff interrogates Lee about her decision not to marry. She wants to be her own woman and not be independent on a husband. Jeff vows he will change her mind in time. The first threat of Uncle Hiram comes in the form of Frank Dilley (with a land recorder) who wants to know who owns which settlement. The group continues to build their houses and each of them is finding riches in their own way. Hampton even has enough money to buy his and his wife’s freedom. Then they are attacked: their feed shed and camp are on fire; Hampton is found hurt and unconscious. They work together to try to put out the fires. The Indians come out of the woods to help as well. But the group loses the cabin, most of the houses and all the chickens are dead. Nugget, Jeff’s dog, is shot as well. Martin Hoffman is missing and they go out to look for him. Jeff and Lee find him, but he’s badly hurt. Jasper tries to help, but Martin dies of his injuries. The entire group is shaken and don’t know if they are going to stay or go their separate ways. The Major is sweet on Becky so she decides to stay. Lee decides to stay as well and vows she will find the one responsible for the fires. They invite Old Tuck and his friends to stay on their land. They try to rebuild but supplies are scarce. Jeff and Lee kiss. Jeff proposes (again), but before she can answer they are interrupted by Frank Dilley and the Preacher, who came to buy their land knowing that there is a lot of gold deep underground. And also to take Lee back to Hiram, who is his employer. They get 3 days to decide. They come up with a plan and Jeff, Tom and Lee leave to go to Hiram in Sacramento. During one of Lee’s night watches, they are ambushed by Frank Dilley, and he tells them Hiram is not in Sacramento at all. They hold Tom and Jefferson under gunshot and force Lee to drink laudanum, drugging her multiple times during their journey. She wakes up in a cabin, where she meets Mary (Hiram’s servant) and where she faces her uncle again. He uses Tom and Jeff as leverage to get Lee to cooperate. She discovers she’s being held in a gigantic mine, owned by Hiram. Hiram makes her put on a blue dress that resembles one her mother used to wear and parades her over his property. He wants to use her to tell him where to dig for gold. Tom and Jefferson are also put in the mines to work, but Lee is outraged at the amount of slaves that Hiram has under his control and the way they are treated. When Lee offers her glass of sugar water to one of the Indian slaves, Frank Dilley shoots the slave in the head. Jefferson comes to Lee’s window at night, asking her to come out to prepare their escape. The next day, Lee purposely sends the mine workers on the wrong path away from the gold line and thus sabotaging her uncle. She also snoops through his things to find her guns but instead finds an old photograph of her mother as a teenager. Lee sneaks out at night to meet Jefferson, but he is not alone. Tom, as well as Mary (shocker, she’s a spy!) and Muskrat (the leader of the Indians) are there. They are planning to rebel against Hiram and get all the slaves out because Hiram wants to kill them all for bounty money. Lee agrees to act as a spy. The next morning Hiram knows she snuck out and orders her to be tied down to the bed at night until she behaves again. Lee asks Wilhelm (her 24/7 chaperone who never speaks) for a tour around the mine grounds to try to familiarize herself with the surroundings, but she comes across a human ‘pig pen’ with dead bodies. Hiram finds out Lee lied about the gold vein and is pretty harsh with her. Lee is sent back into the mines. Her magic is changing, becoming more sensitive, and it feels as if the gold is speaking back to her. She almost makes the wall move. Lee finds written proof that Hiram owns a Mr. Hardwick a huge amount of money. Lee confronts Hiram about her mom’s picture and the way he is trying to dress her like her. Hiram confesses the murders and tells her that her father deserved to die because he took Hiram’s wife, land and daughter. Hiram claims to be Lee’s father. He tries to destroy her Dad’s boots, but Lee saves them from the fire. Lee gets pen and paper from Hiram. She uses it to communicate with Jefferson. Lee hides the gunpowder and laudanum she’s getting from Muskrat and the others. Everyone gathers for a meeting at the Church with the Reverend. Chaos ensues as several Indians who “disrespect the word of God” are whipped. Shots are fired. Knives are drawn. Jefferson saves Lee and their plan is set in motion: blowing up the walls of the mines. Lee finally gives in to the fact that she’s in love with Jeff. In the chaos, Lee manages to flee with Jefferson, Tom, Mary and the horses but she wants to go back because she’ll never be free from her uncle. They go back. They set the entrance of the mine on fire but only half of it collapses. Hiram finds them and tries to stop them, but Lee summons all the gold around her and the mountain and the mines cave in completely with her power. Lee is attacked by Hiram but Jeff and Wilhelm overpower him. They force Hiram to drink laudanum and leave him behind. The faith of Muskrat is unknown. They travel back to their winter home. After a while Lee receives a letter: a formal invitation to the Christmas ball in Sacramento on behalf of the new governor himself. The entire town of Glory donate over $4000 for Lee’s plan to ensure everyone’s safety. Jeff gives voice to his concern that he’ll never be a landowner due to his heritage. Jeff, Tom, Henry, Mary and Lee go to Sacramento to attend the ball and meet with James Hardwick. James has put Hiram on a prison ship until he can pay off his debt. Frank Dilley is dead. James and Lee agree to a deal under the condition that Hiram leaves California forever and Glory must be granted a proper town charter when California becomes a state. Jeff and Lee dance at the ball and watch the fireworks above the river. Lee asks Jeff to marry her and he says yes. How did Like A River Glorious end? After they manage to escape the fighting at the Church, Lee and her friends decide to go back because she wants to end Hiram. Only half of the mine collapses in the explosion, which enrages Hiram. He attacks Lee but Jeff and Wilhelm overpower him. Lee summons all the gold to her and destroys the entire mine. They travel back home where Lee receives an invitation to attend the Christmas ball in Sacramento on behalf of the new governor himself. Once there, she strikes a deal with Mr. Hardwick to make sure Hiram leaves California forever and Glory California gets a proper town charter once California becomes a state. Afterwards Lee asks Jeff to marry her and he says yes.